Today, we’re giving away Dan Marcolina’s brand new iPad app book, AppAlchemy, we’ve been reading and watching it constantly (you will need internet connection for the best experience). It is truly fascinating and I know you will want to get your hands on it. Really no one serious about iPhone photography should be without it. AppAlchemy features overviews of Marcolina’s 40 essential apps and 32 image formulas some with detailed step by step video tutorials. Over 5 hours of video instruction altogether. It also includes many, many resource links and examples of work based around each app by some of the worlds best iPhoneographers. What I love about appwhisperer.com is there continued dedication to mobile photography and providing new and exciting features related to it to help the community learn and grow. 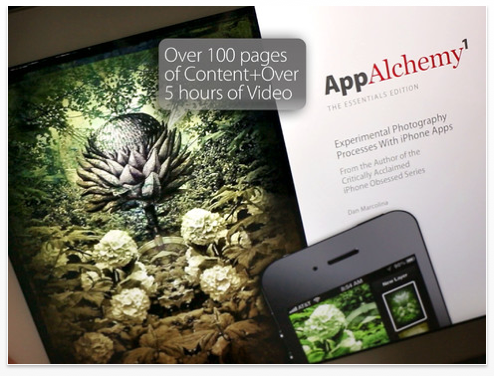 If I am lucky enough to win this eBook, it will allow me to better understand the principles of iPhoneography and be able to create some interesting images with those wonderful apps that reside on the iPhone. In the meantime I thank you for all the incredible tutorials, interviews and general news that keep others and me abreast to what concerns iPhoneographers. Ohh god!!! This is absolutely amazing giveaway!! I want to improve my Iphoneography but all iBook are expensive and on the Internet aren’t many information. Thank you for the opportunity TheAppWhisperer! I love your site. I read it almost everyday because your review and tips for cheaper apps for Iphoneography means for me a lot! I already own iObsessed, a pretty handful resource. Thanks for the awesome giveaways, Joanne! Loving your constant giveaways and updates. Keep it up. Awesome giveaway! Dan is a pioneer in IPhoneography. Thanks Joanne for a chance to win! I have Dan’s iObsessed and would love to get this new reference to help me get to the next level. Keep up the good work here, the new tutorials are great! Once again, The App Whisperer entices me in for a giveaway and I wind up spending an hour reading interviews, reviews and tutorials. Great work! Want, want, want!! Love Dan Marcolina’s work & books!! Than you theappwhisperer for all these wonderful opportunities!! How fresh is The App Whisperer? So much so that it has been one of, if not the absolute best place with all the new scoops on the iPhone 5. App Whisperer has daily content that includes reviews, tutorials, and even the app giveaways. These are all fine and dandy, but if there were just reviews and tutorials I would be content. The fact that Joanne and her team update this site on a daily basis is what adds a great deal of value to me. The App Whisperer is worth every one of the 5 stars I gave them on Alexa…truth is, if there were 10 stars, I’d give them that! I have too many photo apps and no time to figure out which one to use. TheAppWhisperer has plenty of tips for you to sort out the mess. This week’s giveaway is particularly on topic. Thanks for giveaway! I purchased this app yesterday at its’ debut price of $4.99. I just wanted to stop by here to say its a great app, full of in-depth content and great video tutorials. Both novice and experienced iPhoneographers should be able to find useful tips. A very nice giveaway from The App Whisperer. Would love to have this Book!! thanks for the give-a-ways! Yes, please. Might I have a copy, please. And thank you!! I am your number one fan…no matter what anyone else says!! Love and kisses!!! sweet, only the app whisperer could offer this opportunity. I would love to have this app, thanx appwhisperer! I simply love the AppWhisperer because it keeps me up to date with all the quaint photo apps..AND gives me the chance to win apps for free!! !